George Barker, Judith Bihr and Margit Rosen collaborated to curate the Radical Software exhibition, dedicated to the Raindance Foundation which, as soon as 1969, gathered some emerging video art pioneers, among them Frank Gillette. One of his artworks, entitled “Track/Trace”, has two dates on its label: 1972, which is the date of its analogue creation, and the one of its restoration to the digital era, 2017. Media archeology is a discipline which demands exactitude. 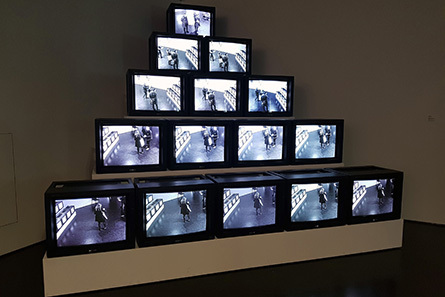 This sculpture, as it is a sculpture, which has fifteen screens of cathode ray tubes, keeps on questioning its audience, forty-five years after its creation. 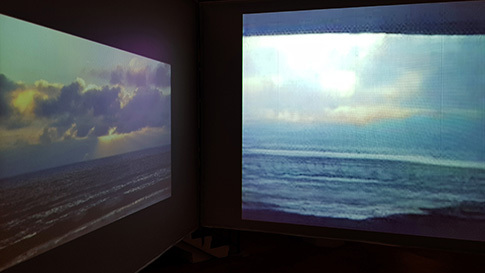 The images, captured in real time by three cameras, are played with delays increasing with the screen rows. In front of so many points of view and more temporalities relating the same situation, we accept the idea that we are no longer aware of where and when we are observing, through these captures of a work that is constantly observing us. This apparatus, in contrast to video surveillance systems that offer a global and immediate vision, makes a situation which is relatively simple more complex, so that we experience it differently. The Datumsoria exhibition was confided to Zhang Ga, guest curator of Shanghai’s Chronus Art Center. With its title associating the Latin words “datum” and “sensoria”, the exhibition merges data and sensory, in order to encourage us to reconsider our perceptive space in this digital era with works by ten artists, among them George Legrady’s. Entitled “Voice of Sisyphus”, it is based on a photograph taken by the artist, but we don’t know where and when. But its title also sends us back to Sisyphe, from the Greek mythology, who was sentenced to roll a rock until it is at the top of a hill, but will never reach. 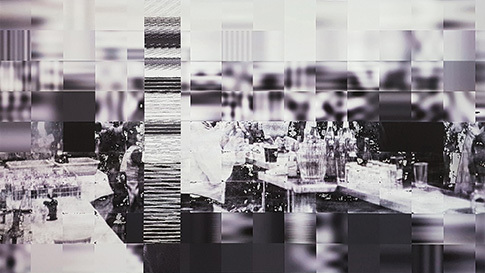 From this original photograph, the artist creates a movie, of which the data appears to us diversely altered in a duration that seems infinite. In the grid of the audiovisual details which are constantly reconstructing the image of a situation, at the bar, there are inevitably elements that are likely to guide us in the narrative. Besides, we cannot neglect any of them, just as the audience of the movie “Last Year in Marienbad” (1961) by French director Alain Resnais. Concerning the invisible and the distance, our senses are not sufficient and it is where scientists offer interpretations by data visualization. French artist Laurent Grasso’s “Solar Wind” installation emerges from collaboration with researchers of the French National Space Centre (CNES) which, in real time, supply him with data on solar activity. 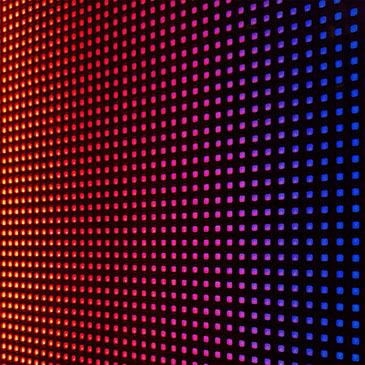 The large screen, made of LEDs, was erected as a granite stele in the Datumsoria exhibition. It allows the perception of the activity of the invisible, coming from the distance. A solar eruption, in 1989, left millions of Quebecers without electricity for hours. In this digital era, this screen stele increases the perception of our immediate environment, as much as it warns us of possible catastrophes to come. The color saturation corresponding to the intensity of the solar activity reinforces the idea of a possible cataclysm that all civilizations, ours included, have always feared. 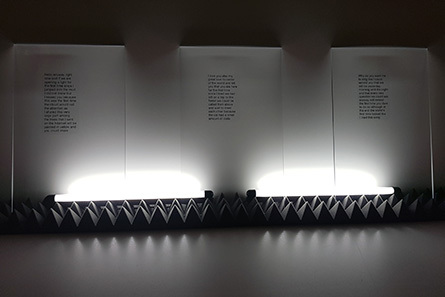 Alongside Peter Weibel, Nolasco-Rózsás, Yasemin Keskintepe and Blanca Giménez have set up the Open Codes exhibition, of which the base line “Living in Digital Worlds” gives us an idea of the concept. Spanish artist Soliman Lopez introduces here “Column 1-0”, which summarizes the idea of the event. 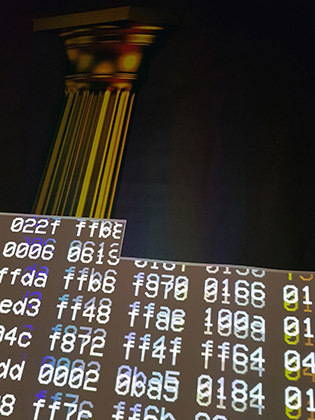 He gives us both the source code and the representation of a Doric column at the same time. At the top of the column, a chapiter symbolizes tradition in architecture. While the support of the representation, a canvas, as for oil painting, is drilled by the code that enables the machine to calculate the image. It is like there is a bug in the world, which is ours. An accident, which would betray the sham that we live daily. Are our wishes, to the last detail, anticipated, as it is the case for Jim Carrey’s in “The Truman Show” (1998), directed by Peter Weir? But the movie production would have given way to digital companies which know everything about us. Constant Dullaart’s “DullDream” installation is about beauty. More precisely, it is about a kind of beauty offered by the applications of our smartphones, or that sometimes we impose on ourselves. Indeed, the landscapes on Instagram are often more beautiful than in reality. Constant Dullaart, who started the artist company DullTech with the slogan “Make technology boring once again”, created the site “dulldream.xyz”, allowing anybody to upload a picture. The purpose of the application based on the use of artificial neural networks is to offer an alternative which is more morose, more boring. It is about artificial intelligence, but the idea of improvement is considered differently. When a landscape is bright, it gets darker and the harmonious faces become ungraceful. We must concede that photography has never been farther from reality. And retouching application softwares are easy for anyone to use. The artist’s dream is duller than our fantasized reality. If there are machines that are able to learn by themselves, as in deep learning, there are others which, merely, memorize our actions. This is the case of applications with which we exchange short messages via our smartphones. Thierry Fournier begins typing texts, systematically taking the words that are prompted, stating with the first one. The writings from the “Oracles” series that come from this can easily be qualified as automatic. And there is no doubt that André Breton and Philippe Soupault, authors of “The Magnetic Fields” (1919) which is the first automatic written book, would have appreciated this method consisting of delegating. They wrote this book together, just as Thierry Fournier inspired the application of which he validated the choices. We can consider that the troubling strangeness that results from this collaboration, or more exactly this hybridization between the human and the machine. 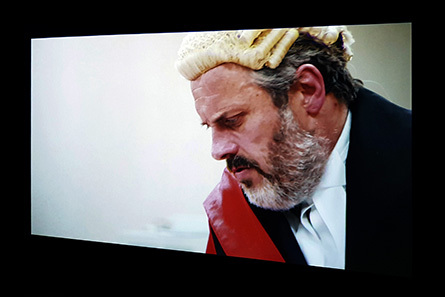 Helen Knowles, who lives and works in Manchester, has conceived and filmed the trial of the “Superdebthunderbot” algorithm which is presented as a computer with a transparent box. But we must not judge by the transparency of this machine because it has itself been accused of murder. Its intelligence program, artificially developed by an unscrupulous debt collection company, allegedly incited two students to make unregulated medical tests, which led to their death. The algorithm is judged for having posted risky job advertisements in the immediate digital environment of the two victims. Deep learning specialists are not yet encoding consciousness into the programs they develop. What reassures us to a certain extent is at the heart of a questioning on the responsibility of a relatively autonomous program. Would it not be judicious, beyond a situation so farcical, to be prepared for a new type of trial? Animals have been judged in the past, machines could be in the future! Post-Internet is a trend in which artists claim the digital as a medium and which the artworks of a new materiality are reaching the art market. That is why an institution such as the ZKM ought to highlight it. Curators Giulia Bini, Sabiha Keyif, Daria Mille and Philipp Ziegler made it by organizing the Hybrid Layers exhibition. An event that, inevitably, considers the societal issues that are amplified by the digital. 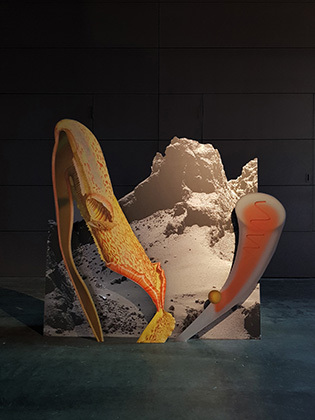 And it is in that context that we discover Katja Novitskova‘s “67P potential (monkey cut plant)” installation. From Estonia, she is also the author of the book “Post Internet Survival Guide”. She digs image materials online and rearranges them in the form of sculptures, contextualizing them within white cubes. In this way, she reveals the immoderate interest we have for animals, and, more widely, for our natural environment, considering the predominant position of animal representations on the Internet, where popular cultures are developing and consequently where judgment of taste expresses itself. Written by Dominique Moulon for ETC Media and translated by Garance Moulon, January 2018.